A light weight travel trailer that accommodates 5-6 people. 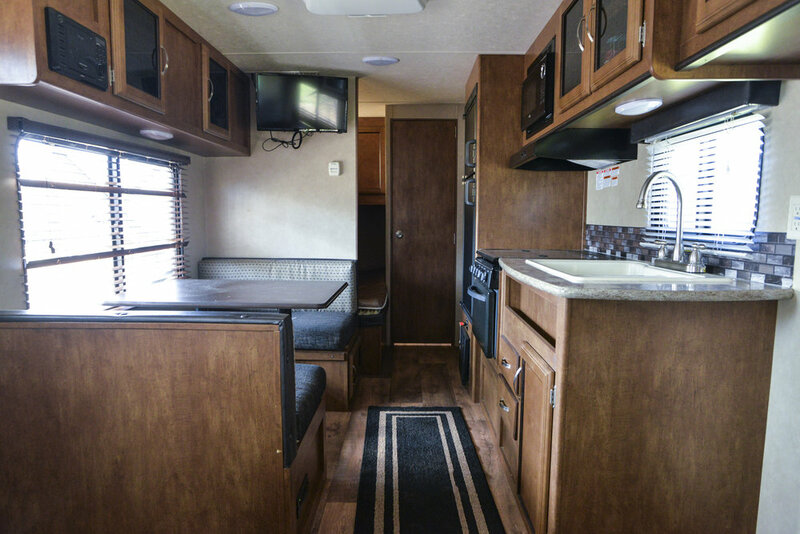 This unit has a wide open floor plan with a Master Queen, this trailer also has a sofa that breaks down at the foot of the Master Queen the unit comes with a Full kitchen that includes a dining table which breaks down into an additional sleeping area, as well as a 32 In flat screen TV. This unit has a Shower bathtub combo. This unit also has a set of bunks in the rear a single bunk over a double. The outside of the trailer is complete with an awning for a comfortable outside patio area. This can be self towed to almost any location! !